Fannie Sellins (1872–1919) lived during the Gilded Age of American Industrialization, when the Carnegies and Morgans wore jewels while their laborers wore rags. Fannie dreamed that America could achieve its ideals of equality and justice for all, and she sacrificed her life to help that dream come true. 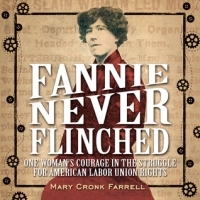 Fannie became a union activist, helping to create St. Louis, Missouri, Local 67 of the United Garment Workers of America. She traveled the nation and eventually gave her life, calling for fair wages and decent working and living conditions for workers in both the garment and mining industries. Her accomplishments live on today. This book includes an index, glossary, a timeline of unions in the United States, and endnotes. After serving as president of her local union, Fannie traveled to different cities giving talks about working conditions. In the early 1900s, these were often treacherous-- buildings in poor condition, workers riddled with disease, and dangerous jobs performed by very young children. The union not only worked to get these conditions improved, but took up collections to help families affected by them. Strikes were common and often brutal. At one of these, in Black Valley, Pennsylvania, shots were fired into a crowd, and Fannie was killed. The police inquiry absolved the officer, and even commended the force for keeping the peace! The formatting of this book is excellent-- while I'm not usually a fan of larger books (this is about 10" x 10"), this size allows plenty of photographs and a lot of space around the text. While it may seem silly, this is a HUGE selling point. Readers are often reluctant to pick up books filled with dense blocks of text and few pictures. The buttons and cogs at the bottom of the sepia toned pages also make this a more reader-friendly book, and that will go a long way to entice children to read about this important historical figure. I loved this author's Pure Grit, but felt that it was too long and involved for most of my readers. Fannie Never Flinched struck an excellent balance between easy-to-read format and amount of information. It's a great starting point for National History Day projects (especially in 2016-17, with the theme being Taking a Stand! ), and will intrigue and encourage readers to investigate the other sources listed in the bibliography.